"This recipe is from the 1992 Bush-Clinton presidential campaign." Beat butter, brown sugar, granulated sugar, and egg until light and fluffy, about 3 minutes. Beat in hot water and vanilla. Gradually beat in flour, baking soda, and salt, until well blended and smooth. Stir in chocolate chips. Drop dough by well-rounded teaspoons onto greased cookie sheets. Bake at 375 degrees F (190 degrees C) for 10 minute, or until golden. Cool cookie sheet on a wire rack for 1 minutes, then remove cookies to a rack to cool completely. 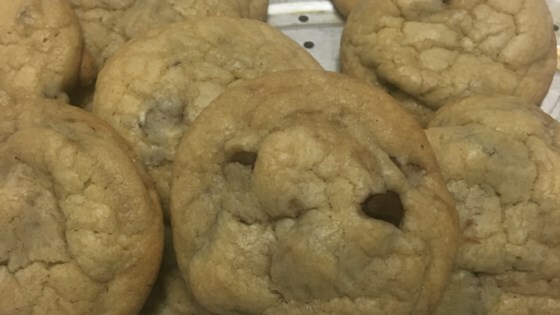 This recipe only makes 12-15 small cookies and is a little too too sweet. I would adjust and add less sugar.